Cholera's Grip On Haiti Continues To Tighten The number of Haitians killed by cholera has climbed to more than 1,300, with tens of thousands of others sick with the illness. The deadly epidemic is spreading as Haiti is preparing to hold elections, nearly a year after an earthquake devastated the capital. The United Nations announced Tuesday that less than 4 percent of the estimated $168 million needed to combat the cholera outbreak in Haiti has been pledged. Meanwhile, the official death toll continues to rise. Haitian officials say cholera has killed more than 1,300 people and more help is needed. Cholera has now been detected in eight of Haiti's 10 provinces, and the Haitian Health Ministry has confirmed almost 57,000 cases since the outbreak began last month. At a cholera treatment center run by Doctors Without Borders in Port-au-Prince, Haiti's capital, Jacques Ordinay lies on a cot. The 37-year-old is in a large white tent with a half-dozen other patients. A drip line runs into the back of his hand. Jacque Ordinay, 37, is suffering from cholera, despite taking precautions. Unlike 1 million other Haitians, he did not lose his house in the Jan. 12 earthquake. Ordinay says he's very worried about this cholera outbreak. "I had the chance to be more careful than others and I got the disease. The people living outdoors and in the unclean areas, they'll be even more affected by it," he says. The January earthquake left more than 1 million people homeless. Now, cholera has spread throughout the capital, including the overcrowded camps for quake survivors. Ordinay says he was feeling fine on Sunday. But the disease hit him Monday and a few hours later he was laid out on this cot. "I was feeling horrible," he says. "I couldn't talk. I couldn't hold myself up. I had cramps throughout my body. I had diarrhea. I was vomiting." But he says after a day at the treatment center, he is feeling much better. 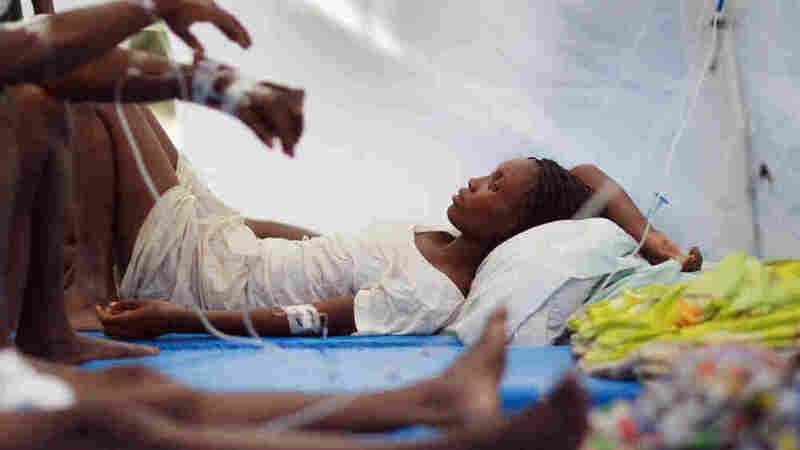 Cholera can kill a person within a matter of hours. It also can be treated fairly easily. The problem is that because Haiti hasn't had cholera for decades, much of the country lacks the infrastructure to address it. Doctors Without Borders opened this treatment center -- with 20 hospital tents -- in the capital three weeks ago. "Patients are in different stages, [with] different severity of cholera," says Aurelie Baumel, who is with the group. "So you see some patients who are lying [down], to have their rehydration solution. Others are better. They can sit and have their rehydration orally." Baumel says the average stay is just three days and then the patients can go home. Michel Jansen, a doctor with Doctors Without Borders, says it's very hard to say whether the epidemic in Haiti will get worse in the coming days. "It's like three-day forecasting of the weather. Nobody knows what will happen. What we [are sure of] is that every day [there are] 600 new patients. That means the outbreak is still going on," Jansen says. He says Doctors Without Border is ramping up treatment centers across Haiti but there's no way they can reach every rural village in the country. Jansen says other aid groups in remote parts of Haiti should start offering cholera treatment in addition to whatever their normal work is. He says this is necessary in part because without treatment roughly one-third of patients die but also because now that it's arrived, cholera is going to be in Haiti for years to come.